September 24, 2015 – On August 21, 2017 a total solar eclipse will pass across the continental United States, from Oregon on the west coast to South Carolina on the east. The eclipse will be a phenomenal experience for the millions of people who see it, but it also offers a unique opportunity to conduct scientific research of the solar atmosphere. To take advantage of this opportunity, Philip Judge of the High Altitude Observatory (HAO) is leading an international collaboration to make new and novel measurements of the solar corona during the total eclipse from visible wavelengths to the far infrared (IR), under almost pristine conditions. With the light from the Sun eclipsed, the solar corona becomes visible in a way not possible when swamped by the light from the photosphere. The IR spectrum of the corona, in particular, is extremely useful in diagnosing the magnetic field of the solar atmosphere. Three instruments flying on the NCAR GV aircraft will use this opportunity to obtain imaging spectroscopy and spectropolarimetry of the corona from high altitude as the aircraft follows the shadow of the moon. To complement these observations, a ground-based spectral survey will be performed using the NCAR FTS instrument. This experiment will provide the first moderate resolution spectral survey of the entire corona from 2 to 12 microns. The team at HAO is currently conducting a feasibility study on the best location for deployment of the FTS. One possibility is the 2.3 m telescope at the Wyoming Infrared Observatory (WIRO), where the Sun will be 96% eclipsed. 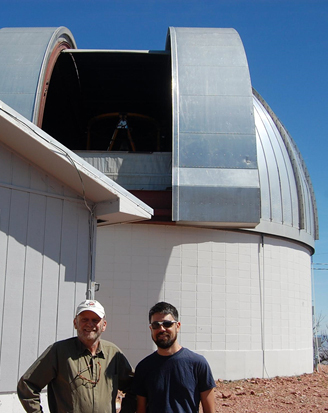 On September 11, 2015, Philip Judge and Paul Bryans of HAO visited WIRO and met with Chip Kobulnicky (WIRO director) and Jim Weger (WIRO engineer) to take a tour of the telescope and facility. The telescope is a classical Cassegrain with 2.3 m primary mirror. Pointing such a telescope, which is designed for observing the visible and IR night sky, directly at the Sun poses significant safety risks. There are also many technical issues associated with coupling the FTS instrument to the telescope that remain to be resolved. Even though there are still two years until the eclipse, conducting such a feasibility study now is crucial to choosing the correct site and set-up for the experiment to be a success.